Event organiser Anita Koochew from Eastern Community Legal Centre with Wurundjeri Elder Kim Wandin. Pictures: Kath Gannaway. 179394-02. 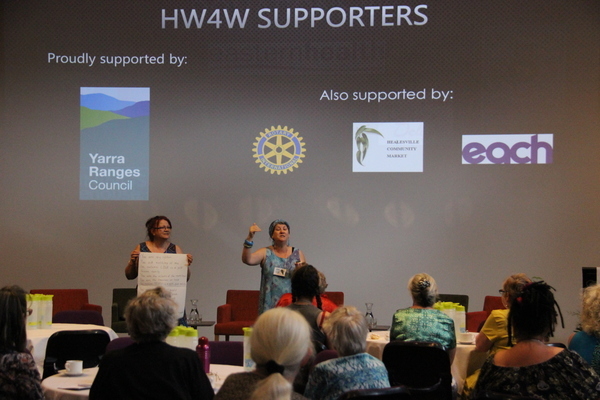 Connection was a key theme at the Healesville Women4Women event on Sunday, 18 March. Presented by Strengthening Women in Healesville network as a launch event for an ongoing network, more than 100 women took part starting with a Welcome to Country by Wurundjeri Elder Kim Wandin and followed by a series of inspiring and informative speakers, wellbeing treatments, workshops and craft activities. As MC, Cr Fiona McAllister put herself firmly in the picture identifying as a woman, sister, daughter, friend and auntie. 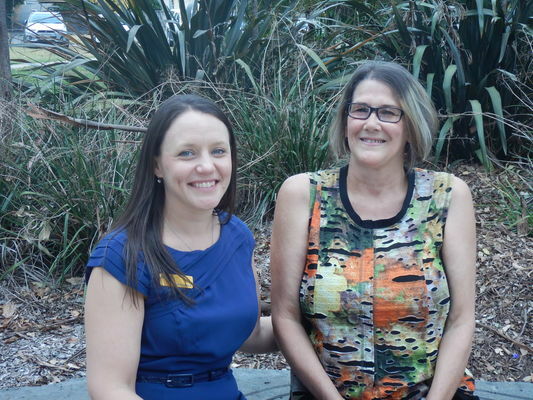 “The aim is to improve access, communication and empowerment of women living and working in Healesville. 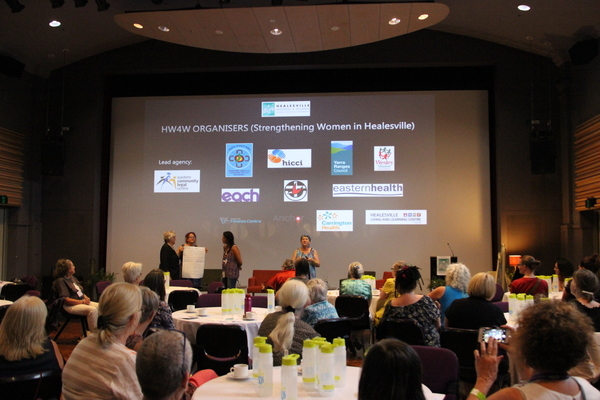 “Today is the start of this initiative and I know it will grow into a self-sustaining collective of women working and living in Healesville,” She said. An event on Sunday, 29 April in Healesville will maintain the momentum and the energy that was generated in bucket loads on the day. The two hour get-together will be the first meeting aimed at shaping the group and having fun with Red Moon Rising access-friendly belly dancing and yoga. Women4Women organiser, Anita Koochew from Eastern Community Legal Centre, said the March event set a strong foundation for the group with the sense of connection a highlight. “It was the connection of women and that it actually helped local women as well as the organisations to connect with each other in an environment that felt safe, warm, relaxed and fun,” she said. Each speaker was asked to give a closing message. Describing Healesville women as strong, beautiful and bold, Lesley Porter said “Remember, you are not your story, you can created a new story every time you wake up. 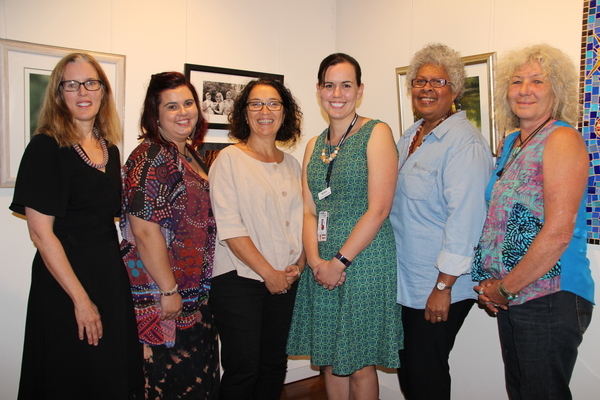 Dr Doseena Fergie addressed her message in particular to the Aboriginal and Torres Strait Islander women in the room. Michelle Atwell said “We all wear different hats – mum, work colleague, partner, friend; put a hat on for you and take some time out for you,” she said. Michelle Cornelius was wearing her health nurse hat. “There are lots of services in Healesville. If you need help or support, ask someone,” she said. 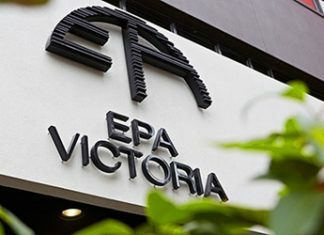 To register for the 29 April event email yarraranges@eclc.org.au . For more information join the Healesville Women 4 Women group on facebook .